October can bring a welcome relief from heat and flies, but as winter approaches it means colder temperatures, mud and shortened daylight hours. Riding can become a challenge and as they say every second counts! While you can’t control the weather, with some planning the winter months can still be a productive and enjoyable time for you and your horse. Bones and Joints – the colder weather can affect your horse’s movement and the temperature can impact both joints and muscles. This is because cold temperatures increase viscosity (thickness) of synovial fluid, making joints feel stiff to the horse. Therefore it is important to make sure your horse has a good ‘warm up’ before any high impact activity so as not to cause any long standing problems. Horslyx Mobility Balancer can also help your horse through the winter with its ingredients of Glucosamine HCl, MSM and Omega Oils to support healthy joints. Respiratory System – Workouts in the cold weather can cause problems in your horses Respiratory System leading to shortness of breath, coughing, and the inability to perform at their best. Dry cold air can cause tissue damage, so through the winter as a preventive measure it is good to try to ride in a well-ventilated indoor arena when possible or to avoid riding during the coolest time. Supplements can also help your horse through the winter so try giving them a Horslyx Respiratory Balancer which contains menthol, eucalyptus and aniseed to support the airways, alongside the high specification balancer package which helps maintain immunity. 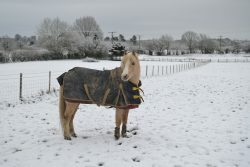 Water – Ensure your horse always has access to fresh water and that you check any water sources for freezing. As temperatures drop often your horse will drink less water so consider adding electrolytes and/or warmer water to encourage drinking. Forage – Your horse’s intake of forage is also very important throughout the winter months. Most horses will get their forage supply and nutrition through hay in the winter when grass is in shorter supply. In addition, hay provides the horse with the required fibre for hindgut health. If your horse is stabled for longer during the winter you could consider a trickle net to keep him entertained and slow his intake. Alongside this there are other forage sources available, Fibre-Beet, hay cubes, ready grass etc. Leaving a Horslyx Balancer in your horse’s stable will also ensure they are getting the correct amount of vitamins, minerals and trace elements needed to balance the deficiencies in forage and grazing. Monitor Body Condition – an easy and effective way to monitor a horse’s weight is by body conditioning score. You should aim to monitor your horse’s body condition score every few weeks leading up to and during the winter months so you can be aware of any changes.